After enable restrictions from the “GamiPress – Restrict Content” meta box, some new tabs will appear to let you configure how restrictions should be applied to the post to users that not meet the requirements. Checking this option will restrict the access to users that not meet the requirements. This is the most restrictively option, so checking it, the rest of restrictions (content, links and images) will no take effect. Page where users that not meet the requirements are sent when trying to access directly this post. Note: You can configure a common page to redirect following this guide. Checking this option will restrict the content of the post to users that not meet the requirements. Default content to show on the post with restricted content to users that not meet the requirements. 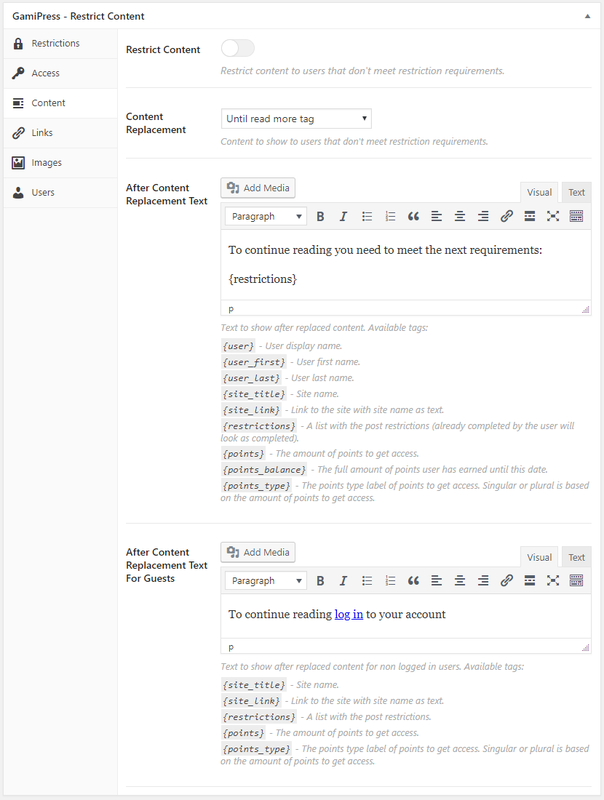 Until read more tag: Restrict the content until the read more tag . Replace content with excerpt: Restrict the content replacing it with the post excerpt (post type need to support excerpts). Trimmed content: Restrict the content into a limited number of characters. Number of letters to show on the post content if content replacement is set to trimmed content. Text to show to users that not meet the requirements after the restricted content of the post. 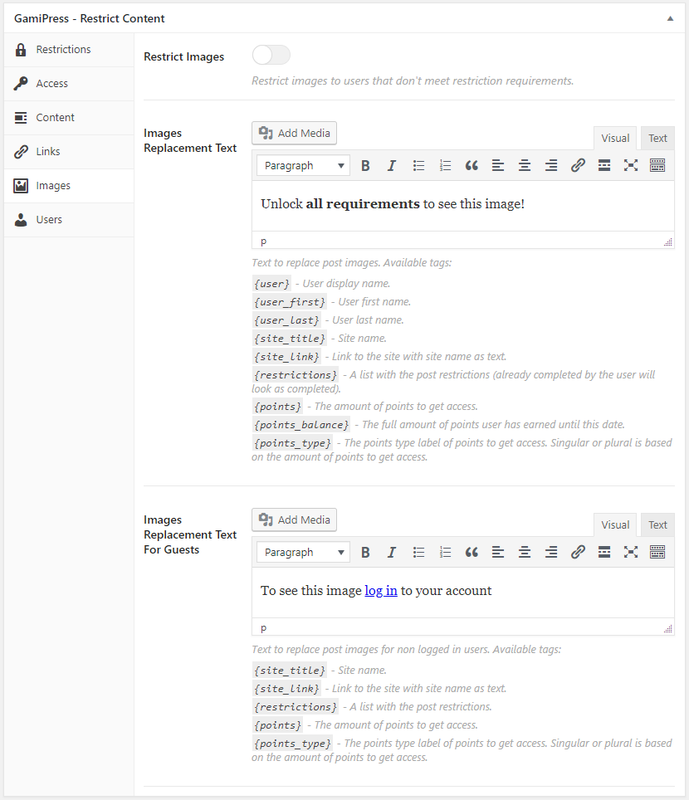 You have some tags that dinamicaly will be replaced by a specific content to let you make more personalized messages. Text to show to non logged in users after the restricted content of the post. Checking this option will restrict the links of the post content to users that not meet the requirements. 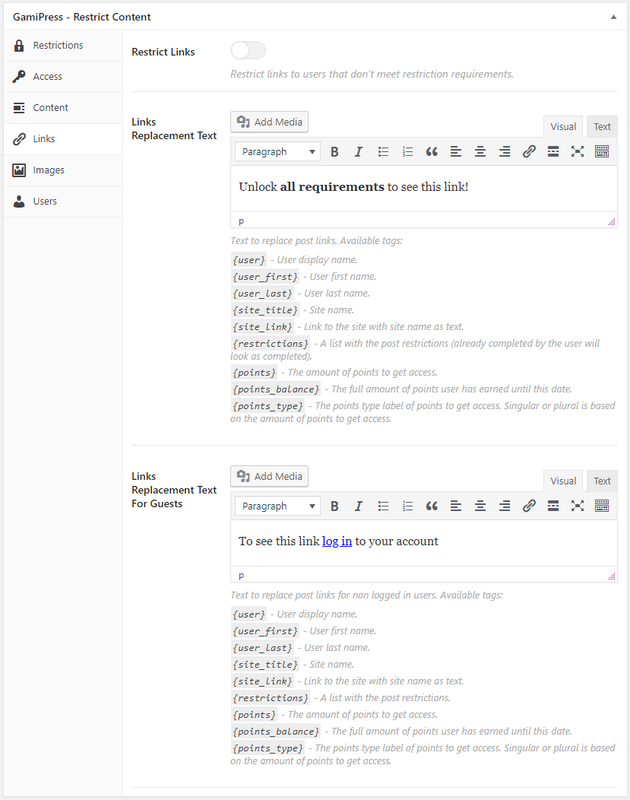 Text to replace the content links to users that not meet the requirements. Text to replace the content links to non logged in users. Checking this option will restrict the images of the post content to users that not meet the requirements. Text to replace the content images to users that not meet the requirements. Text to replace the content images to non logged in users.